As such, residents and visitors are being advised to monitor both systems (Disturbance 1 and 2) as both have the potential of reaching the Caribbean. 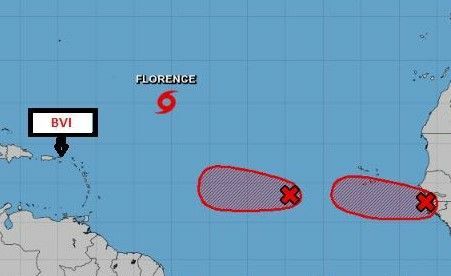 ‘Florence,’ according to NHC was at 5:00 AM today, approximately 930 miles East North East of the VI. Meanwhile, as it relates to the tropical disturbances being monitored, DDM, notes the first of weather systems being monitored has demonstrated a 90 percent chance of development. Forecasters continue to predict that if it did reach the eastern Caribbean, it would not do so until late next week. I love the Good Book - always speak the truth - Matthew 24: 7, 8. What has been prophesied will without fail take place.